Clayborn Lab and its staff have accommodated us greatly with our heating projects for our biomass facility. 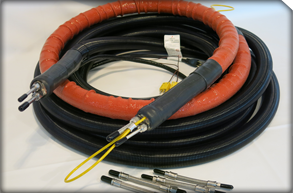 The heated tubes using Clayborn’s design have minimal power consumption, and they are ideal for long sampling lines. Automated wrapping process provides short manufacturing lead times; 10 days ARO. At the heart of this innovative product is Clayborn Heat Tape, spirally wrapped onto your choice of tubing (Teflon, aluminum, stainless steel, etc.) with your choice of sizing (1/16” O.D. to 4” O.D.) and accessories. Custom engineered for individual use, Heated Sample Lines give you the flexibility to heat most anything using voltages from 12VDC to 277VAC. Control the temperature with the use of a variable voltage supply, an embedded thermostat or through thermocouple / RTD feedback on your controller. We offer indicator lights for user awareness; strain relief for durability; a variety of coverings to choose from and Clayborn engineering to ensure you know it’s done right.